There are obvious downsides. Losing loved ones, constant era-related learning curves, endless days, etc. Think about all the times you've looked at a clock and wished the hours would pass a little faster, then imagine a lifetime of those days where all you can do is trudge through. And if you're the least bit fashion conscious, consider the massive wardrobe turnover. But there would be benefits to eternity. Countless opportunities to try new things and have new experiences, perhaps meeting some of the brightest minds and greatest artists of decades to come. Living history and realizing in the moment that people's children and grandchildren will learn about an event you witnessed in real time. Of course, there's also the hope that you've found the kind of epic love that will last an eternity. The kind of whirlwind romance where every day feels like the shivers of anticipation that come with a first kiss. Eternity may seem daunting, but, if you have the right person beside you to pass the time and share a laugh on the days where there's less awe in the world around you, then living forever might not be so bad. 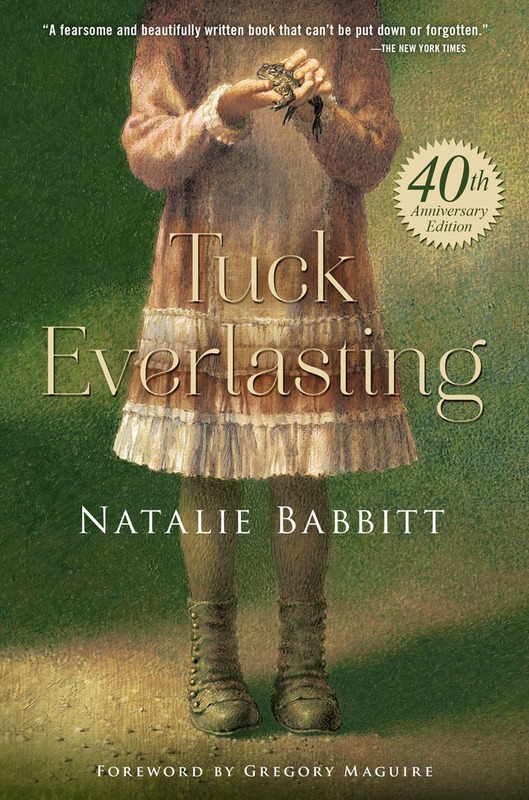 2015 marks the 40th anniversary of Natalie Babbitt’s celebrated, ground-breaking title Tuck Everlasting. In celebration of the anniversary, Macmillan Children’s Publishing Group will publish a special anniversary edition featuring an introduction from Wicked author Gregory Maguire. Natalie will be in conversation with Gregory Maguire at Symphony Space in New York City on Sunday, January 25 at 1:00 PM. Alexis Bledel, star of the 2002 movie adaptation, will read from the book. Natalie Babbitt is the award-winning author of Tuck Everlasting, The Eyes of the Amaryllis, Knee-Knock Rise, and many other brilliantly original books for young people. She began her career in 1966 as the illustrator of The Forty-Ninth Magician, a collaboration with her husband. When her husband became a college president and no longer had time to collaborate, Babbitt tried her hand at writing. Her first novel, The Search for Delicious, established her gift for writing magical tales with profound meaning. Knee-Knock Rise earned her a Newbery Honor, and in 2002, Tuck Everlasting was adapted into a major motion picture. Natalie Babbitt lives in Connecticut, and is a grandmother of three.